Darjeeling: A paragliding accident in Kalimpong left one dead and a tourist grievously injured on Saturday. The pilot of the ill-fated paraglider, 22-year-old Purushottam Timsina, died on the spot while 32-year-old Gaurav Choudhary of Patna was injured in the accident. "The accident occurred at around 1:30 pm. The paraglider had taken off from Delo. While landing at Homes Ground, it hit a tree," stated Dipen Tamang, Secretary of the Kalimpong Paragliding Association. A part of it tore off and landed on the terrace of a nearby house. Both Timsina and Choudhary were rushed to Kalimpong District Hospital. Timsina who had suffered head injuries was declared brought dead while Choudhary is undergoing treatment at the district hospital. A 20-member tourist group had arrived in Kalimpong on Friday. On Saturday, they had visited Delo. Two from the group had decided to paraglide. The other managed to land safely. Choudhary works as a customer care personnel in Mahindra and Mahindra in Patna. "He has suffered heavy injuries mainly in the legs. We have lodged an FIR," stated Nirmal Dubey, a tourist who was accompanying Choudhary. Timsina, who hails from Pokhara, Nepal, had joined Kalimpong Tandem Paragliding two years ago. "He was a trained paragliding personnel and was very good at his job. It is an accident," added Tamang. There are seven agencies in Kalimpong offering paragliding services. The paraglider who met with an accident was from Kalimpong Tandem Paragliding. "We have started an unnatural death case. Investigations are on," stated Dhrubajyoti De, Superintendent of Police, Kalimpong. Tandem Paragliding has been asked to temporarily suspend services till inquiry is on, stated a police source. Kalimpong offers two types of paragliding flights — medium and high flight. Take off point for both are same — Dello View Point. The landing point for the medium flight is Home's Ground and for the high flight it is Relli river ground. The flying time ranges from 10 to 30 minutes. A paragliding accident in Kalimpong left one dead and a tourist grievously injured on Saturday. 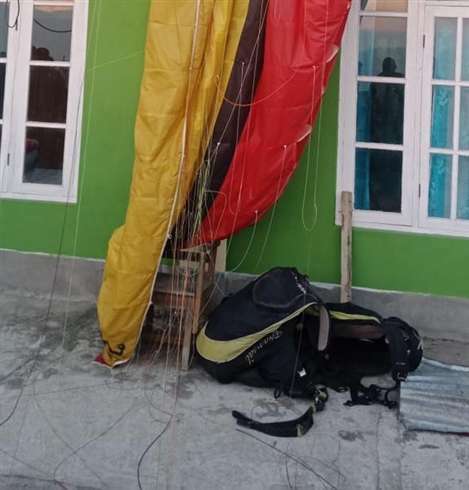 The pilot of the ill-fated paraglider, 22-year-old Purushottam Timsina, died on the spot while 32-year-old Gaurav Choudhary of Patna was injured in the accident.